INTUSI, the new INTeractive USer Interface from Liebherr, connects Liebherr machines to the Internet of things (IoT). 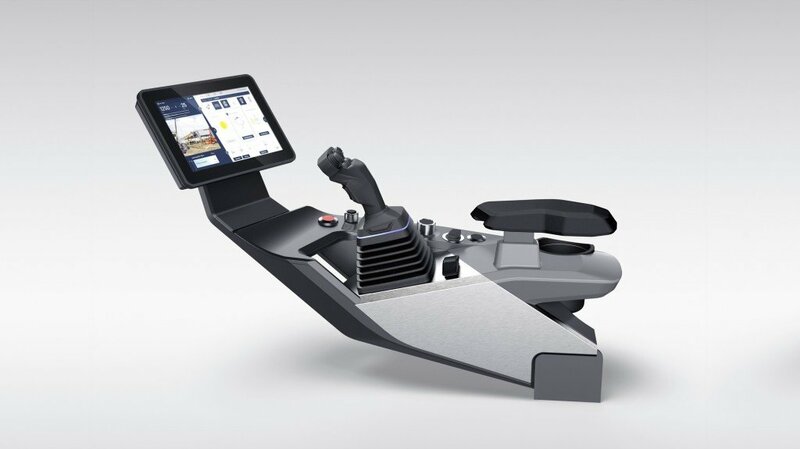 At bauma 2019, Liebherr will unveil INTUSI, its INTeractive USer Interface, to the public for the first time. Liebherr says that this innovative, adaptive and intuitive operating concept will revolutionize the communication between and with construction machines. INTUSI connects Liebherr construction machinery and material handlers to the Internet of things (IoT) and is combining an intelligent operating logic with clever machine intelligence. With INTUSI, Liebherr has created a completely new, modern control environment. As a result of digitalization, the construction site is increasingly a logistics environment where human and machine as well as machine and machine exchange information. There is currently a shift from straightforward machine operation to communication between driver and machine. Driver assistance systems, as well as functions from the networked world of Construction 4.0, are becoming more important. Therefore, Liebherr's objective was to provide machine operators with a future-focused machine interface with Liebherr's characteristic transparency and clear overall logic. Going forward, the new concept will be used in all Liebherr earthmoving machines and material handlers. Relevant machine functions that provide reliable support for the machine operator are the basis for efficient machine use. With INTUSI, Liebherr links operating and machine intelligence. The new operating concept integrates various assistance systems and automates safety functions. For example, if the machine detects that dusk is falling, the operator is automatically notified of the changing external conditions and is alerted to switch on the lights. To enable continued safe and comfortable working with a growing number of functions, Liebherr divides different function categories into widgets according to theme and situation, a bit like operating a smartphone. Essential and relevant operations are quickly and directly accessible to the machine operator for their current activity as soon as they press the master operating element on the joystick or on the console. For example, specific control of the claws is opened directly on the tablet when the machine support is activated with the joystick. The associated widgets can also be called up by directly selecting the corresponding function category on the tablet. In order to provide the driver with short handling paths, Liebherr studied typical interaction patterns in detail and transferred them to the underlying logic of INTUSI. In addition, the home screen always displays all feedback on the overall machine status. Construction machines need to operate safely even on rough terrain. That's why haptic operating elements are still provided in addition to the multi-touch tablet. A clear innovation is the integration of a navigation cross directly in the right joystick, for which an additional rotary element is also provided. The operating buttons in the ergonomically designed right console can be extensively modified according to personal preference. This also increases operating comfort. The layout of the tablet's user interface can also be individually adjusted by the machine operators and saved in their driver profile. Higher level functions can easily be stored for direct call-up and, in addition, all functions can always be selected via a separate main menu. Topcon Positioning Group has announced a new automated edition of its 3D modular aftermarket solution for excavation — the X-53x automatic. The system uses the same components of the original system and adds hydraulic, automated control. Topcon Positioning Group announces the introduction of Pavelink, a cloud-based logistics application designed to connect every stakeholder in real-time throughout the paving process. The mobile application is designed to complete a connected ecosystem workflow between the asphalt plants, delivery trucks, company office, and paving site. Topcon Positioning Group has launched a new edition of its real-time 3D job site monitoring and management system — Sitelink 2.0. The update includes a new pay-as-you-go point-based service model, new features to Sitelink Support Desk, as well as a new Haul Truck application. Topcon Positioning Group announces the release of major updates to its flagship 3D dozer machine control system — 3D-MCMAX. The innovative inertial measurement unit- (IMU) based system, without a mast needed for the blade, is now available for more configurations and diverse applications. Moving dirt is the foundation of just about every project. This is where the job starts off fast or slow, exact or "close enough," on-time or late. Even the smallest variance in one direction or another can have a huge impact on timing, accuracy and profitability. Precision is everything when constructing road surfaces. Tolerances are very tight, ensuring that the surface is smooth for vehicles travelling on it while also providing a long service life. B2W Software unveiled key product developments to extend the advantages of its unified ONE Platform during the company's annual User Conference in San Antonio, Texas, March 3-5. CM Labs Simulations, developer of Vortex training simulators, is releasing the Instructor Operating Station (IOS), CM Labs' dedicated solution for directing, monitoring and assessing trainees. Designed to complement CM Labs' Vortex simulators for operator training, the IOS provides rich functionality for engaging training sessions, while its smart monitoring tools enable a 360-degree perspective on trainee progress. Telia, Ericsson and Volvo Construction Equipment (Volvo CE) have launched Sweden's first 5G network for industrial use at Volvo CE's facility in Eskilstuna. Volvo CE will then become one of the first in the world to use 5G technology to test remote-controlled machines and autonomous solutions. Trimble has announced that it has enhanced the Trimble PULSE field management suite with an advanced, SaaS-based telematics platform that connects, monitors and manages assets to enable intelligent decision-making and timely actions. Trimble PULSE Telematics provides a single platform for service, equipment and fleet managers to collaborate and connect their workflows to allow for improved sharing of information. Ironworks LLC has announced the addition of two major western Canadian construction contractors to its roster of beta program participants for Ironworks, the world's first comprehensive, cloud-based equipment cost management system for infrastructure contractors. Trimble introduced today the Trimble Groundworks Machine Control System, a reliable and streamlined machine control solution for drilling and piling operations. The next-generation system enables contractors to perform drilling and piling operations quickly, safely and accurately. Hitachi is taking efficiency to a new level with Hitachi Grade Guidance, integrated and developed in cooperation with Topcon. Leveraging the latest components and technologies, Grade Guidance is a "one-stop shop" solution that helps complete precision-excavation more efficiently. Trimble announced a new wearable hard hat compatible device that enables workers in safety-controlled environments to access holographic information on the worksite—the Trimble XR10 with HoloLens 2. In addition, an expanded set of Trimble software and services will be available to provide field-oriented workflows that leverage constructible 3D models and mixed reality to solve daily work tasks. Bentley Systems, Incorporated presented SYNCHRO XR, its app for immersively visualizing 4D construction digital twins with the new Microsoft HoloLens 2, which Microsoft announced during a press conference at Mobile World Congress in Barcelona. Trimble introduced today the Trimble T7 Tablet, a rugged, lightweight and versatile device for construction surveying applications. Using Trimble Siteworks Software for construction surveying, the Trimble T7 provides real-time data to visualize cut/fill levels, calculate material volumes, check grade and communicate work orders to increase productivity and enable better decision making. Trimble Exchange is an e-commerce platform connecting Trimble's SITECH dealer network directly with customers in the U.S. looking to purchase pre-owned, refurbished and legacy Trimble products. Inventory listed on Trimble Exchange is populated only by participating, authorized Trimble resellers. Customers shopping on Trimble Exchange complete their purchases through their trusted local dealer, allowing them to shop from a nationwide database and buy locally. Topcon Positioning Group announces the latest upgrade to MAGNET Collage Web, the web-based service enabling the sharing and collaboration of UAV and scanning data sets. MAGNET Collage Web version 1.3 is designed to allow operators to work with more types of data with greater flexibility, including the ability to import BIM models, as well as CAD and GIS data. Kespry, the drone-based aerial intelligence solution provider, is highlighting its new construction industry-focused innovations at the World of Concrete industry trade show in Las Vegas, January 22-26. The international event is the only large-scale show dedicated to the commercial concrete and masonry construction industries. As part of its global strategic alliance with John Deere, Kespry will be featured at John Deere's World of Concrete booth located at C545. It is no surprise that there are plenty of variables that come into play when it comes to optimizing an aggregates operation. One area in particular where telematics and other technologies can improve efficiency and profitability is tracking and managing loadout activities. JLG Industries, Inc. has expanded its BIM (building information modelling) library to now include the company's compact crawler booms, making the full JLG product line available for download on www.bimobject.com, an industry leading platform for BIM, with select models available directly through JLG.com. CostTrax, powered by EquipmentWatch, is a new software solution that streamlines reporting, automatically flags questionable expenses, and ensures every reimbursement request is 100 percent compliant. Every construction contractor knows how paper can build up in the office and on the jobsite during work on any particular project. When it comes to a building contract, the requirements are pretty much the same no matter how high the bid, and owners need them all met before they sign the cheque. Construction companies are beginning to adopt technology of various kinds as growth continues in 3D modelling, machine control and other sectors, but there is more to the jobsite than just that. In many cases, contractors need to track other conditions that can have an effect on the success of a contract. Procore has long been passionate about the evolution of Building Information Modeling (BIM) and the benefits of Virtual Design and Construction (VDC), and the company believes these best practices will continue to grow as a standard in the industry. Trimble has released Earthworks Grade Control Platform version 1.7 with support for motor graders and automatic guidance for tiltrotator attachments. Trimble Earthworks for Motor Graders is a GNSS-based, 3D grade control solution designed to make fine grading more accurate, faster and easier than ever before. In addition, Trimble Earthworks now gives excavator operators using tiltrotators the advantage of automatic machine control, which can result in increased productivity. JLG Industries, Inc. is prominently featured in Precision Construction: Principles, Practices and Solutions for the Internet of Things, a new book highlighting a series of eight case studies of digital technologies in action from contractors, rental companies, OEMs and suppliers. Topcon Positioning Group has announced a new series of documentary videos designed to bring greater awareness to automation and technology in the construction and agriculture industries. Along with thought leadership from Topcon, the documentaries feature interviews with various tangential industry experts and business representatives – including comments from Intel Corporation, SAP and Solar City Corporation, among others – offering their perspectives on how technological advancements have changed infrastructure and what to expect going forward. Updates have been released to the Sage and Procore Integrations announced in June 2018, making them better equipped to serve users across the construction industry. With enhancements to the Sage 300 CRE integration and launch of the Sage 100 integrations, Procore is able to offer something to every construction professional, regardless of your size or trade. Improving upon these two Sage integrations has been another step toward providing tools that work for professionals throughout the industry, streamlining their jobs and simplifying the workflow. Autodesk, Inc. has signed a definitive agreement to acquire PlanGrid, a leading provider of construction productivity software, for $875 million net of cash. This acquisition will enable Autodesk to offer a more comprehensive, cloud-based construction platform. Topcon Positioning Group announces a new firmware update for the GLS-2000 scanner designed to enhance its vertical construction applications, as well as offer a workflow for semi-automated modeling and construction validation. The firmware includes a new setting that allows objects for interior vertical construction to be captured with precise detail. Trimble has introduced the new SPS785 GNSS Smart Antenna, and dynamic tilt functionality for the SPS986 GNSS Smart Antenna. These releases expand the Trimble Site Positioning Systems portfolio with a new, more affordable receiver and added functionality for the SPS986. The announcement was made at Trimble Dimensions. A1A Software LLC continues to improve the interface and features of 3D Lift Plan, making it easier for customers to use the crane lift planning program as a sales tool, for bid proposals, crane selection and setup, lift planning, and documentation. Trimble's Earthworks GO! Grade Control Platform is a 2D grade control solution for compact machine grading attachments. Trimble Earthworks GO! enables high-accuracy grading in an easy-to-use, portable platform. It is the only Bring Your Own Device (BYOD) compact machine control solution available today that runs on Android or iOS smartphones. The announcement was made at Trimble Dimensions. Trimble has announced LOADRITE Payload Management for Trimble Earthworks Grade Control Platform for Excavators integration. This integration will help increase productivity and efficiency for excavator operations, allowing contractors to track bucket-by-bucket payload, and monitor mass haul progress from the same Trimble Earthworks display. The versatile system can be installed on any hydraulic excavator that has Trimble Earthworks, and offers an easy transition between grade control and payload management, maximizing the contractor/s investment. Danfoss Power Solutions' PLUS+1 has provided high-performance, intelligent machine control through its customizable software solutions and integrated hardware. Kraft Fluid Systems, a Danfoss Power Solutions distributor, has been working with Danfoss PLUS+1 for more than a decade. Trimble and Hitachi Construction Machinery Loaders America Inc. (HCMA)announced today the availability of Trimble LOADRITE L3180 SmartScale as an option on Hitachi Wheel Loaders in the U.S.
Topcon Positioning Group announces new accessories for the FC-5000 field computer — a landscape-style keyboard along with a stylus. The accessories are designed to improve performance in the field in harsh weather conditions. PCM, Inc. has introduced the Digital Job Box, a rugged solution that will transform the way the construction industry manages job site projects and connects remote workers to their office counterparts. The Enterprise Technology Group at PCM worked closely with construction industry leaders to create a powerful, rugged, and scalable solution that will allow construction firms and project teams to reduce costs and wastes. Topcon Positioning Group announces the Intel Perpetual License Inspection-Surveying provision for the Intel Falcon 8+ Drone - Topcon Edition will now be included with the system.